Once again, Sitting Marsh is besieged by a murderer. It's hard for Lady Elizabeth to keep tenants when someone keeps killing them off. When Lady Elizabeth rents her cottage (which held the previous dead tenant), she decides to officially welcome him to the neighborhood, only someone gave him his farewell notice before she got there. In addition to her lackluster police department, this case has invited in the secret service and everyone is especially mum about this case, however gossip about who might be a spy runs rampant. Throw in three newly arrived men, not willing to talk about their job and reasons for visiting Sitting Marsh and it's a keg ready to blow. In the town, there's no shortage of suspects and Lady Elizabeth needles them down until only one is left standing and ready to kill again. This is the fifth in the series and there's four more left so I'm torn if I should zip through them (because they're so easy to read) or savor them. The relationship between Lady Elizabeth and Earl is getting as dicey as the storms raging outside and Lady Elizabeth is finding it harder to stay afloat in this choppy weather. Martin's also acting funny and Violet's suspicious of a visitor of his who says Martin's buying raffle tickets. The relationship between Sam and Polly is cooling off and Sadie is having a hard time adjusting to the manor and on page 90 actually asks herself if she shouldn't go back to the high life of London after getting the wits scared out of her. I'm really going to miss this series. "...so I'm torn if I should zip through them (because they're so easy to read) or savor them." this past year, i find i'm reading at a much slower pace - even easy reads such as the Discworld series. it's part a matter of not wanting to miss anything subtle, and part wanting to appreciate the style and literary skill of the author. I actually find that I'm reading much faster since we started the blog. but you're a trained writer. up until 5-Squared, i just read for the storyline. now i'm looking for character development, "show don't tell", active voice instead of passive, etc. "Trained" might be a bit strong. I do think it's funny that you're reading for writing stuff now. I completely apologize for that. Sometimes I wish I could turn off that part of my brain and just read, but really I know that the internal editor is a good thing. heh. it makes me want to take a "Creative Writing" night class at the local community college. but i don;t think my company would be willing to pick up the expenses. Unfortunately, looking for writing styles is an occupational hazard. I've found myself "editing" as I'm reading. I have to slap my hand to get me on the reading track, yet when I read someone grossly violating all the writing laws I hold dear, it's usually "game over" for me at that point. Now that occupational hazard has runoff into movies and television, so when I watch one, I constantly look for character development, plot holes, etc., yet continuity always sticks out like a sore thumb for me. 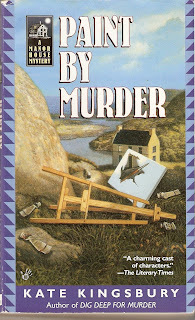 Reading mysteries has instilled in me the desire to look for subtly, which I hope helps my writing and editing process. Time will tell.